The Fuzzy Five - Happy Halloween! 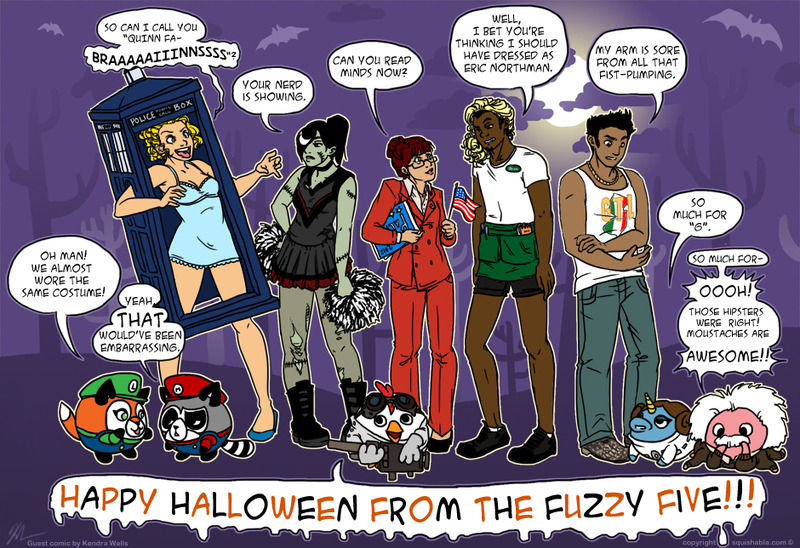 Happy Halloween from from the Fuzzy Five gang!! This is a guest strip from Squishable Intern Kendra, who will be spending this Halloween and a Prom Queen Unicorn, thank you very much. Hee! Super cute. I love the costumes. That Einstein costume is the cutest thing ever. AGREED!!! He’s always super adorable! Meredith totally stole my costume idea!!!!!! Love the Einstein and Mario/Luigi costumes. That’s the second Tardis costume I’ve seen in my comics today. Dag nabbit good stuff you whpipseranppers! I thought that the TARDIS costume was the best thing ever… Until I saw Breakfast as Doctor Horrible. I love Nina and Otto’s costumes. Next year, I’m totally dressing up my squishies.